1) Keep your cats inside. The link here explains how many wild birds outdoor cats kill and the negative effect they have. 2) Never use poison to kill rodents.​ Rodents that have ingested poison often stumble out into the open before dying. The poisoned rodents are easy prey for raptors and many other predators. When a hawk, owl, fox, or bobcat eat the poisoned rodent... they die. Click this link to read more. If you have a rodent problem, snap traps are the way to go! 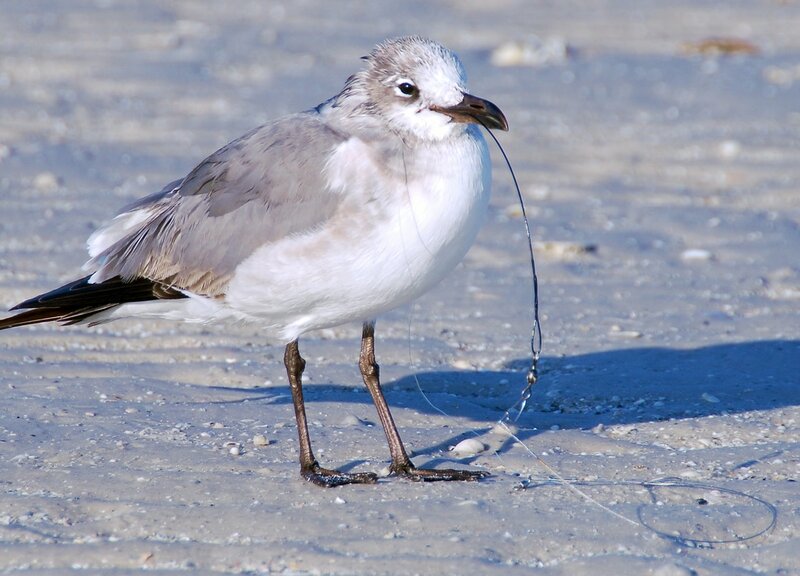 3) Be careful to recycle or throw away fishing line and plastic. We could post endless pictures of entrapped wildlife, but one is enough to see. Fishing line is NASTY stuff. Please make sure it makes it into a recycling tube or the trash. 4) Be aware of the seafood you eat. Here is a guide to what is OK and what should be avoided. Click here to learn more! 5) Try not to use pesticides. Insects aren't most peoples favorite animal, but they aren't the enemy either. Most bugs in your yard and garden cause no harm. Try to use pesticides only when you see damage... not just because you see a bug.